It's water based and it needs a couple drops of water before you start using it. It goes on smooth like an oil based paint and stays on for hours! Important: Don't be surprised if your designs run off when the little ones run around and break a sweat, but keep in mind that anything that would stand up to sweat would be much harder to remove. 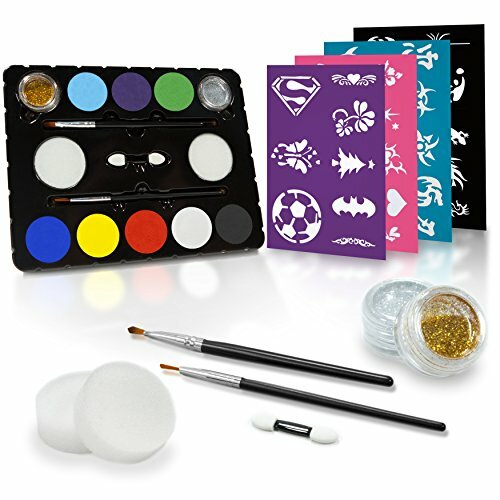 If you want to save money, and make a bunch of kids happy for just a few bucks at the same time, this face paint set is for you. Click "add to cart" now before we run out of stock or price goes up. WATER ACTIVATED MAKEUP FOR PARTIES, 100% SAFE: All of our ingredients were laboratory-tested and are 100% FDA compliant. Remember that you need to add a couple drops of water before you use this face paint. EASY ON, EASY OFF (IF NOT USE BABY WIPES, OR MAKE-UP REMOVER): This paint goes on very smooth and stays on well (many hours if you want it to) These colors blend very easily with each other so you will have no limits to create your own color palette with our 8 base colors. Depending on how much paint you use on each face project you could easily paint more than 50 faces, but that's just a reference and your results may be different. DRIES FAST AND STAYS ON FOR HOURS: Why wait 5 minutes when your kids can start having fun within 60 seconds? Our paint dries very quickly and the child can begin having fun immediately. Our face paint can be removed quickly and easily with a damp cloth, baby wipes... or in extreme cases with make up remover. 32 POPULAR STENCILS & COMPLIMENTARY DESIGN GUIDE EBOOK. Never again get stuck with no ideas for face designs. We've included 24 of the most popular unisex stencils in the kit, plus a complementary ebook with 18 face paint ideas for you to choose from. Keep in mind that pictures on the box and in the ebook are just a representation, your designs could be different. NO-QUESTIONS-ASKED MONEY-BACK GUARANTEE. In the unprecedented event you're not happy with this product, at any time, just contact our store and we'll issue a prompt refund. If you have any questions about this product by Create A Face, contact us by completing and submitting the form below. If you are looking for a specif part number, please include it with your message.